Event Description : DANCE : KALANGAN presents an Evening of Bharatanatyam by the disciples of Guru Jamuna Krishnan. 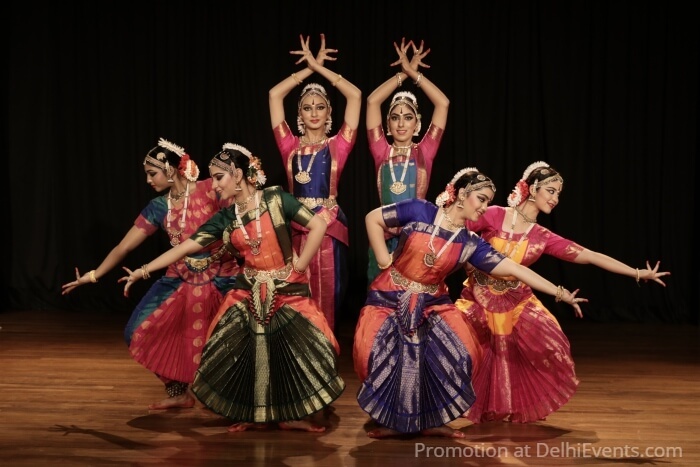 The performance will showcase choreographic compositions that highlight the technique and the lyrical beauty of Bharatanatyam as an ancient dance form that has striking elements of a contemporary mind. This event also marks the release of the first yearbook of Kalangan, Centre for Classical Arts, "Dharohar 2018". Kalangan Centre for Classical Arts is one of the most well established and reputed forums for the presentation and teaching of Classical Arts in the capital. Since its inception 25 years back, the organization has brought to stage several well-known artistes and young talents to the forefront. The institution ranks as a premier centre for learning Bharatanatyam in the country. Sponsors : Unison Insurance Broking Services Pvt. Ltd. and co sponsored by Indian Oil Corporation.